Serafina and I hope that our friends who celebrate Easter had a happy and joyous Holiday. Officially, Easter is the time to remember Christ's crucifixion and resurrection, hence the image of the cross in the opening illustration. Of course there are any number of ways and reasons to celebrate the holiday. 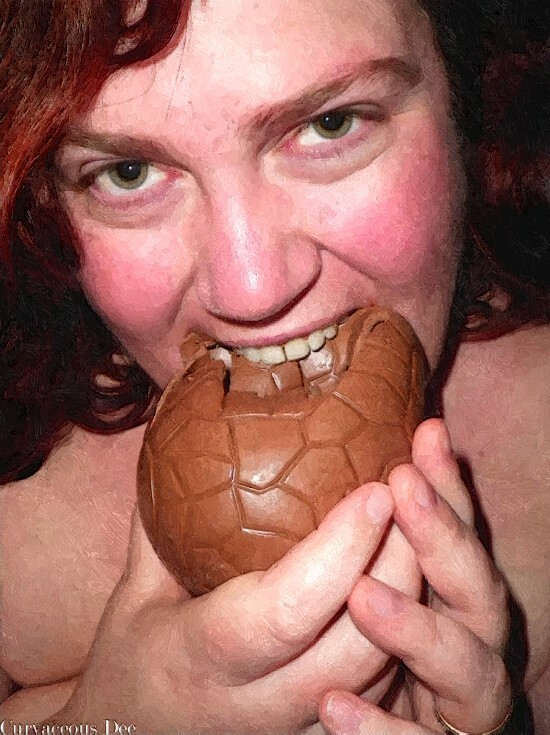 Although it will never rival Valentine's Day, it would seem that Easter is the calendar's second best occasion for the consumption of chocolate. Dee devours chocolate (and life) with glee. The always lovely Curvaceous Dee given the fine art treatment. Happy Easter to you and yours! Very cool reworking of Dee's picture! Thanks for the Easter wish . . . Dee is always a beauty . . . She's my favorite blogger because she has such a wonderful zest for life!